Admin can manage full this software. Add dynamic class, section and group. 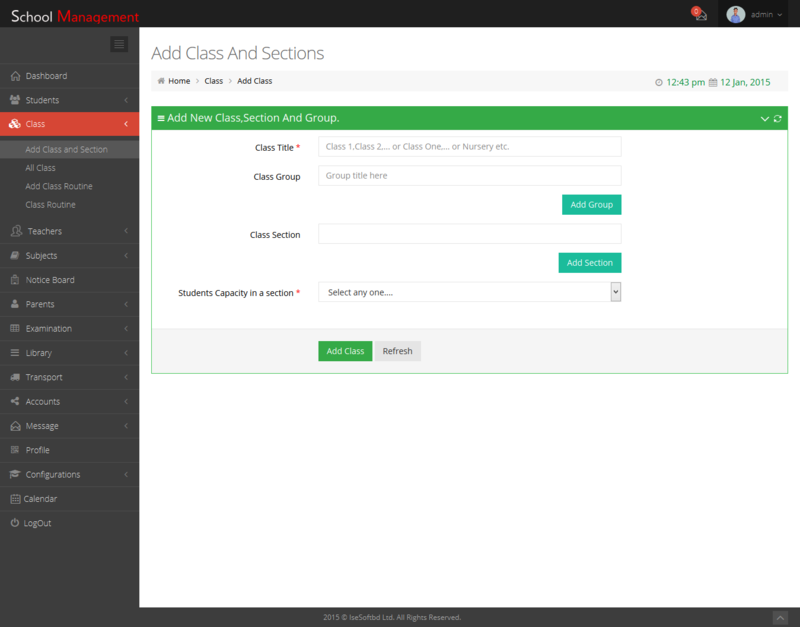 Admin can select student capacity in a class and section. Admin can view, edit and delete class’s information, section and group. 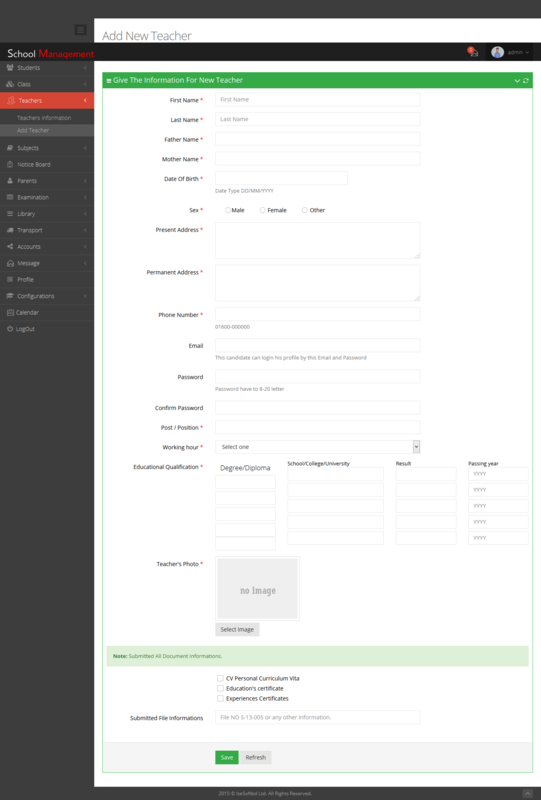 Add new student in this software as student admission. 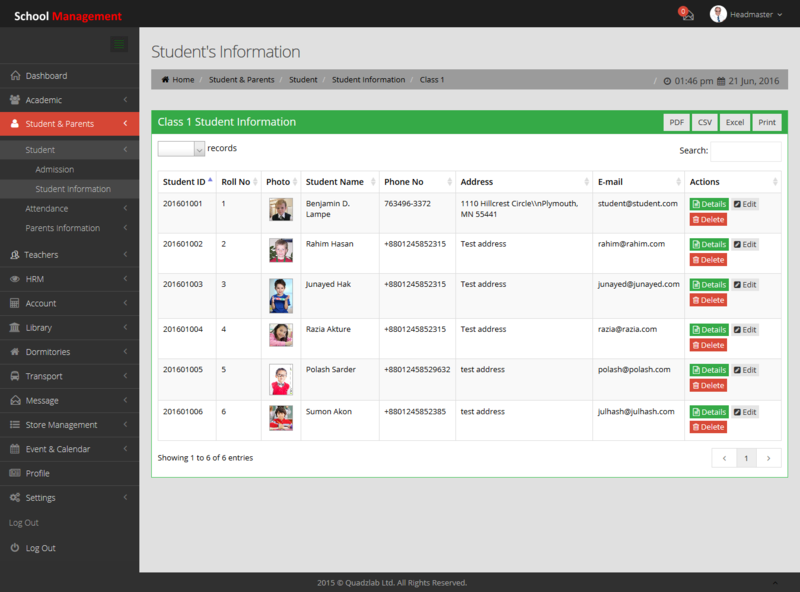 Admin can view student’s details and parents information. Edit and delete student information. Admin can view the full school students attendance percentage. Students attendance percentage have two type a) Daily or running attendance percentage. b) Total or yearly attendance percentage. Add class routine for individual class. Add new teacher in this system. Can edit and delete any teacher’s information. Add dynamic subjects for every class. Can delete from any class also edit class subject information. Admin can declared notice for all user in this software. If admin want declared different notice for different user. Admin can make parents profile for this software. Admin can delete parents profile. Add grade with point for examination. Add exam and exam routine by different class. 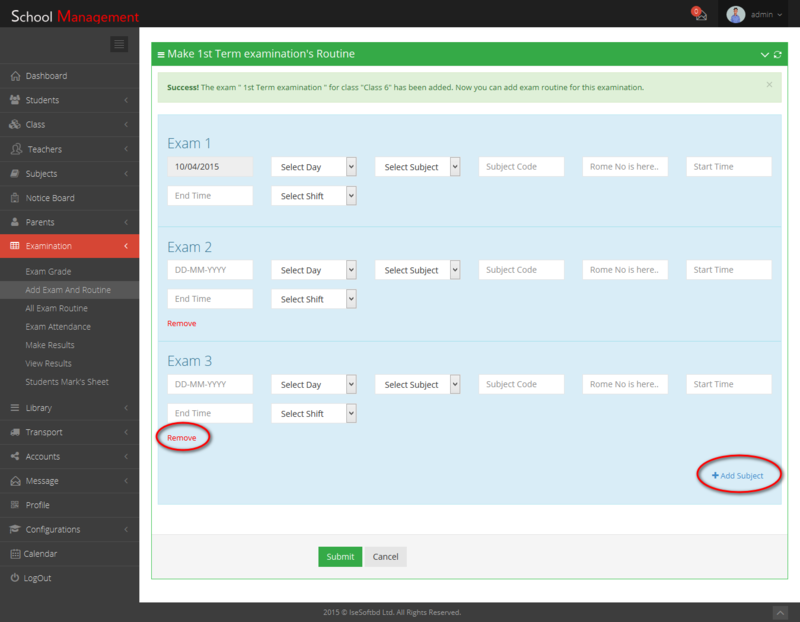 Admin can view all examination routine by class title and exam title. If admin want can edit and delete exam and examination routine. 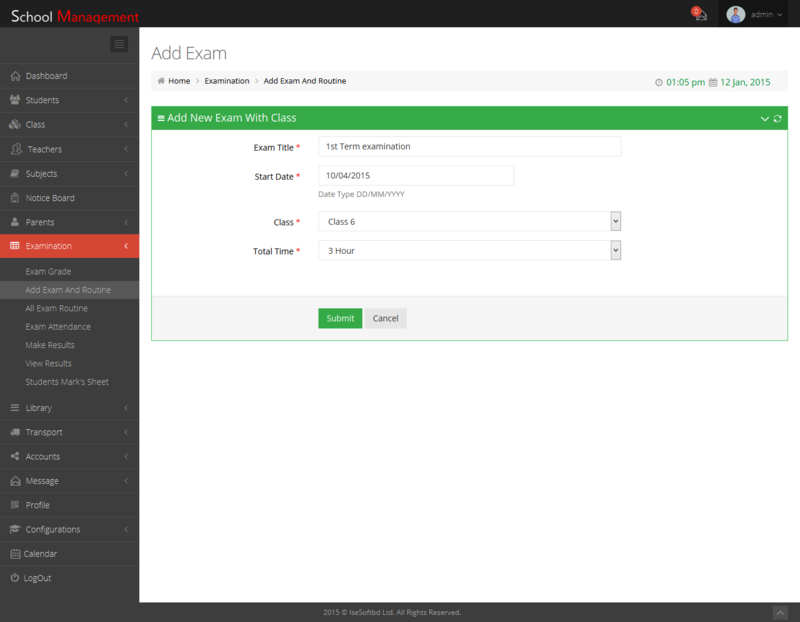 Admin can view the result of examination attendance. Admin can check result sheet and accept result sheet which is sent from teacher. Admin can complete the full result in a class and publish the result. Admin can publish the result in the school for all class. Admin can view any student’s mark sheet. Add new book and book’s category for library in this software. Admin can view, edit and delete books and book’s category from the library. Add new transport, route and vehicles for the school’s students, teachers and employee. Admin can edit and delete this route’s information in this software. 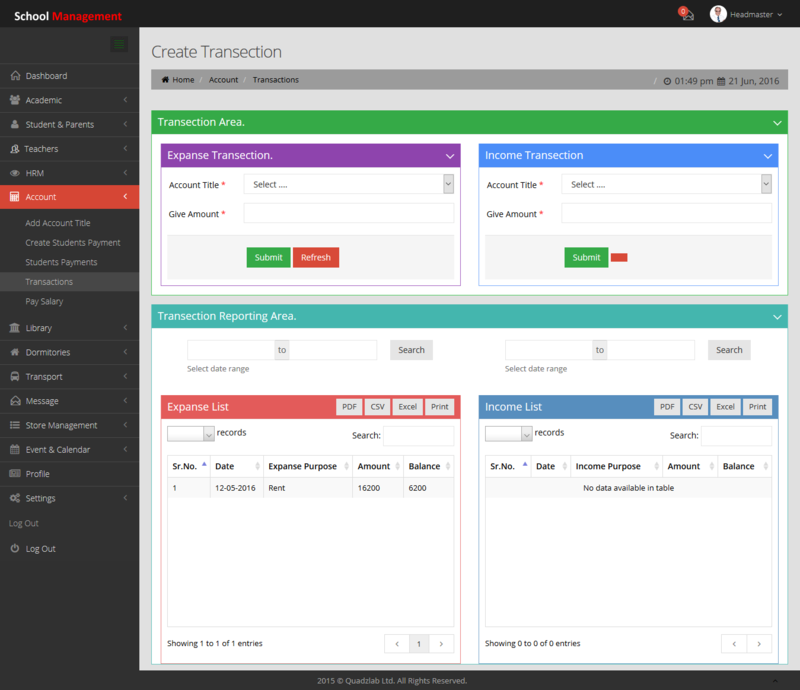 Admin can add account title by account type for controlling the accounting in this software. Admin can edit and delete account title from this software. Admin can make student transaction slip when student give the tuition fee and other payments. Admin can view the full student transaction slip. If admin want to delete this slip, he can delete full slip at a time. If admin want to edit or delete one or two item in a slip, also he can do that. Admin can sent massage to any user in this software. Admin can delete his inbox massager only. Admin can view, edit and change his personal profile information. Admin can set or change the his profile picture, he also can change the password for this software. Admin can change the weekly of day in this software. Admin can change the general configuration settings. Admin can set or change the time zone. Admin can add new dormitories, dormitories room and bed and full dormitories managing access. Admin have a personal events calendar as he wrote down his events in this calendar. 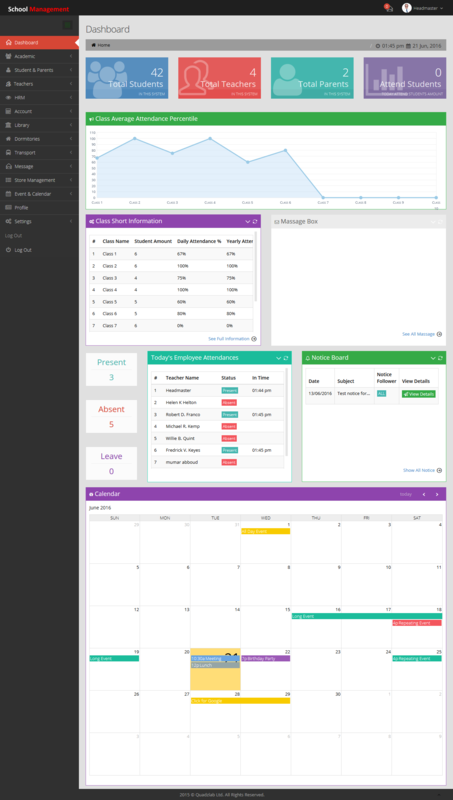 Teacher have a nice dashboard. 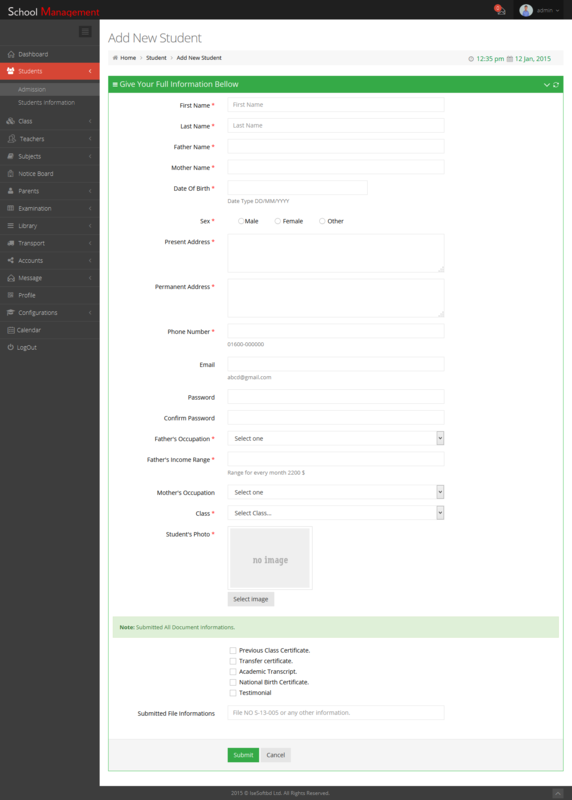 Teacher can view the students information in details. 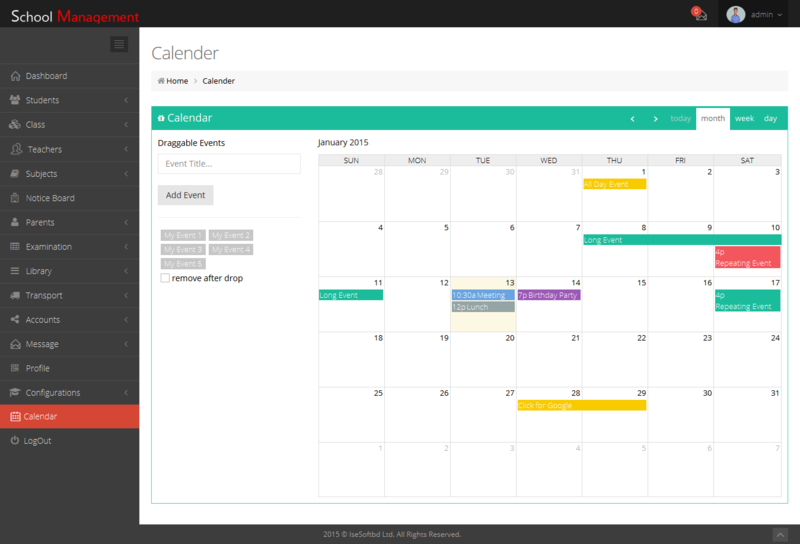 Teacher can view the details information in a class with total student, section and routine. 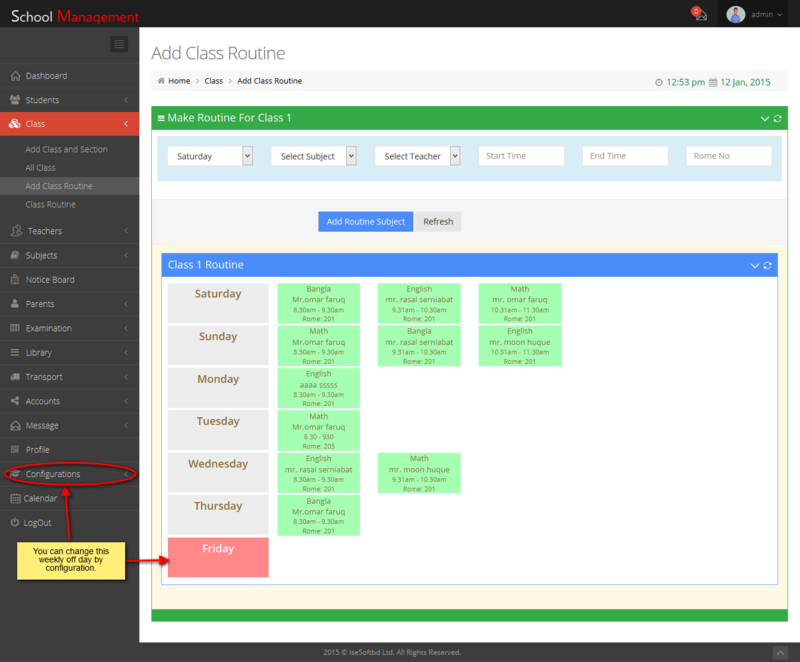 Teacher can view the class routine individual. Teacher can take attendance class students in online. Teacher can view the previous class students attendance. If need to change the attendance previous class teacher can do that. Teacher can view the other teacher’s information. Teacher can view the notice into notice board. Teacher can view the student’s parents information’s. Teacher can take student’s examination attendance in online. Teacher can view previous exam attendance. Teacher can view grade’s table information with point. Teacher can submit student’s examinations subject mark sheet in online to admin for accept that mark sheet. Teacher can view the all result which is published. 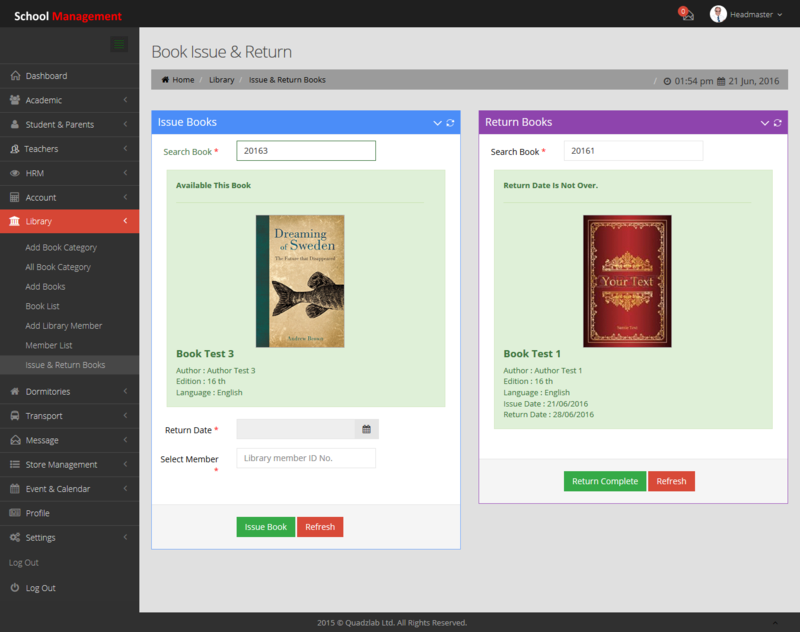 Teacher can add new book category and new book into this software. Teacher can view the library book’s list. Teacher can view the transport information. 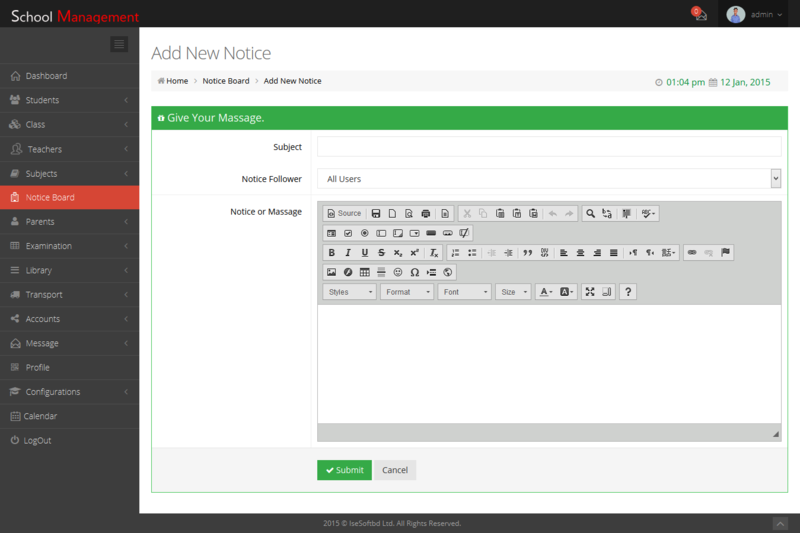 Teacher can send message student, parents, teachers and admin by internal messaging system. Teacher can view and edit his profile information. Teacher can change this profile picture. Teacher can change his login password. Teacher have a personal events calendar as he wrote down his events in this calendar. Student can view class routine. 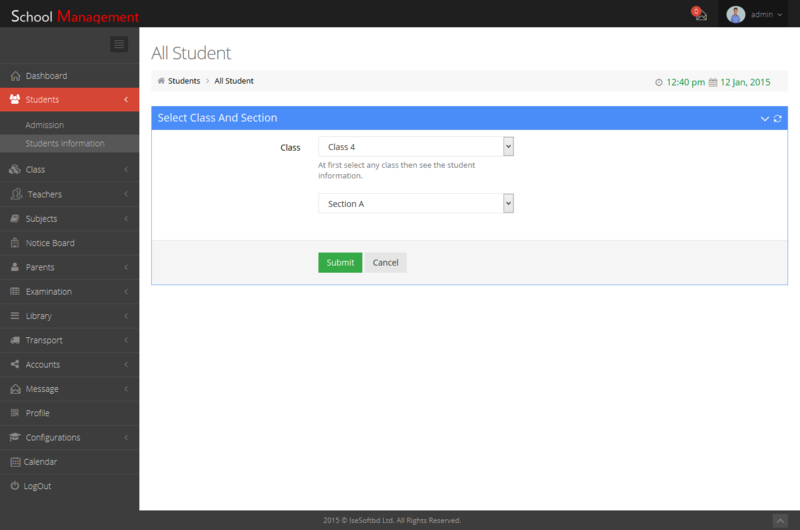 Student can view the class information. 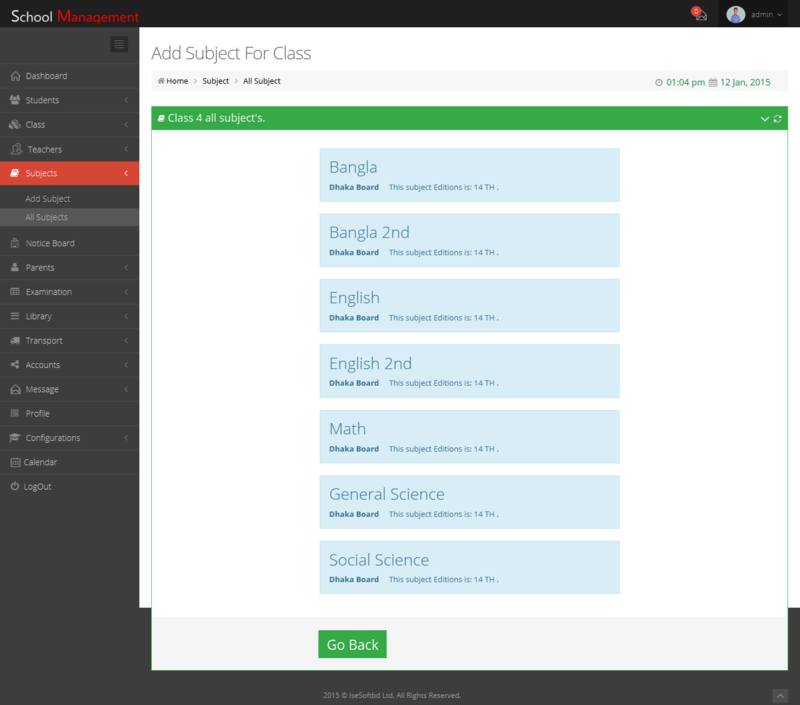 Student can view all class’s subject’s information. Student can view the notice board all notice which are only for declare students and all user’s notice. Student can know about the examination grading system and marks and point. Student can view the all class’s examination routine with his own examination routine. Student can view the examination results which is published. Student can view the library books category and books. Student can send the message the teachers and his classmate. 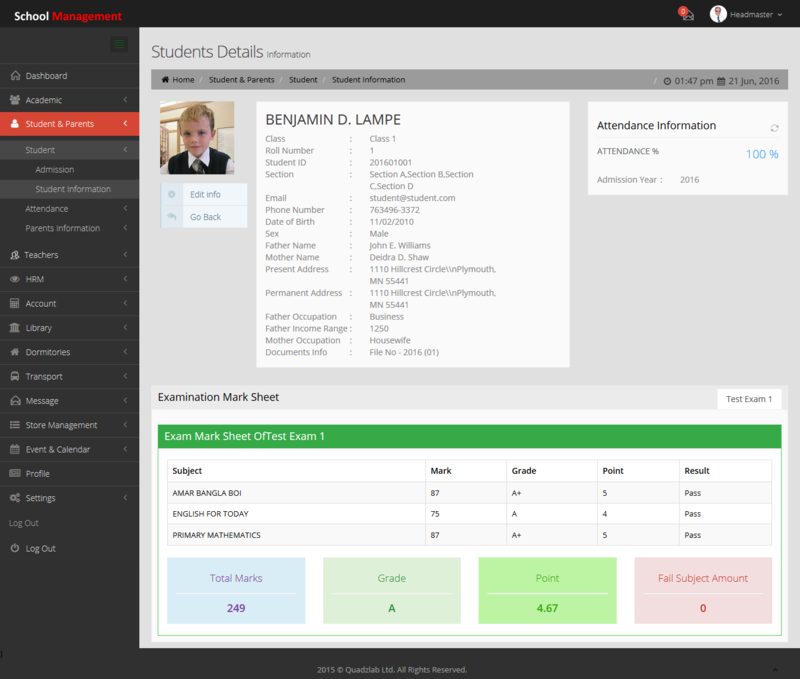 Student can view, edit and change his personal profile information. Student can set or change the his profile picture, he also can change the password for this software. Student have a personal events calendar as he wrote down his events in this calendar. Parents can view class routine. Parents can know about the teacher’s information and contact with them. Parents can view the notice board all notice which are only for declare students, parents and all user’s notice. Parents can know the all other parents information’s. Parents can know about the examination grading system and marks and point. Parents can view the all class’s examination routine with his own child’s examination routine. Parents can view the examination results which is published. Parents can view the library books category and books. Parents can send the message the teachers and admin in this software. Parents can view, edit and change his personal profile information. Parents can set or change the his profile picture, he also can change the password for this software. Parents have a personal events calendar as he wrote down his events in this calendar.